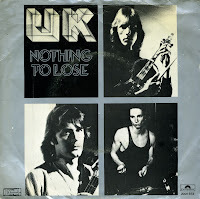 UK released two singles from their 1979 album 'Danger Money': 'Rendezvous 6:02' and 'Nothing to lose'. Funnily enough, 'Rendezvous' was a only a hit in the Netherlands, whereas 'Nothing to lose' could only reach the UK singles chart. It peaked at number 67 in the Summer of 1979. A live album, 'Night after night', was recorded in Japan in 1979 and released in September. Following a final European tour in December 1979, and in spite of plans to record a new studio album in America in March 1980, UK disbanded. I bought my copy of 'Nothing to lose' without actually knowing the song. I always liked 'Rendezvous 602' a lot, and so I presumed this single would be similar. It is a very different song, though, but in its own way it is a nice track. 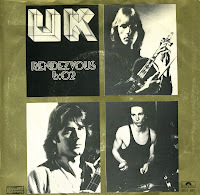 In September 1976, John Wetton, Bill Bruford, Eddie Jobson and Allan Holdsworth formed the band UK. They released a self-titled debut album in 1978 and went on a lengthy tour of America. Holdsworth and Bruford left the band, claiming musical differences as the reason. Terry Bozzio joined the band, and as a result the band became a trio, playing keyboards, bass and drums, supplemented by the violin played by Jobson. They recorded the album 'Danger Money', which was released in March 1979. 'Rendezvous 6:02' was the first single to be take nfrom that album. It peaked at number 24 in the Dutch Top 40 in the Summer of 1979.